Eye candy Friday, sort of. 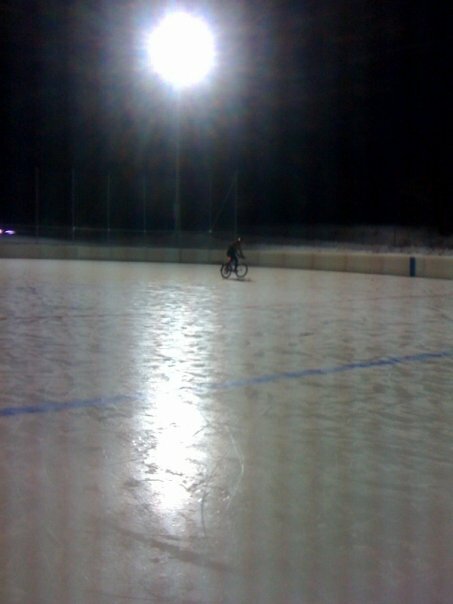 #2 Son has ordered me to add this photo of he* him and his bike on a hockey rink. He suggested that a video would be more impressive because it would show how fast he can get going. I don't know — could YOUR heart stand the excitement? * Sheesh — use English much, Kat™? This entry was posted in Biking, Eye candy Friday, Family. Bookmark the permalink. 0 Responses to Eye candy Friday, sort of. I have to laugh at these. A friend of mine’s daughter is 22 and living in Chicago. I asked her if she would ever think of moving back to the Twin cities. She didn’t think so, because she never wants to own a car and “I don’t want to become one of those bicycle people.” (many among her friends are) When I see these pics of your son, I think he is one of those bicycle people. He should have been here all of the past week: snow and ice on the roads, and the cycle path is still not clear! I have avoided any fatal attraction to gravity so far. Frankly, no, my heart could not stand it. Tell him he should get tickets to see Ski to the Max at the Science Museum’s Omnifest later this month. They actually have someone biking down a mountain with a bunch of skiers and snowboarders. Yikes. Maybe he’s developing a new Olympic event? One spanning both the Winter and Summer Games? Do they make studded bicycle tires? I think of that every time I see a bicycle on icy streets. I’m cold just looking at that. I filled out a job application on line today. I had to display, in narrative, my mastery of grammar. I hope I get asked for an interview.